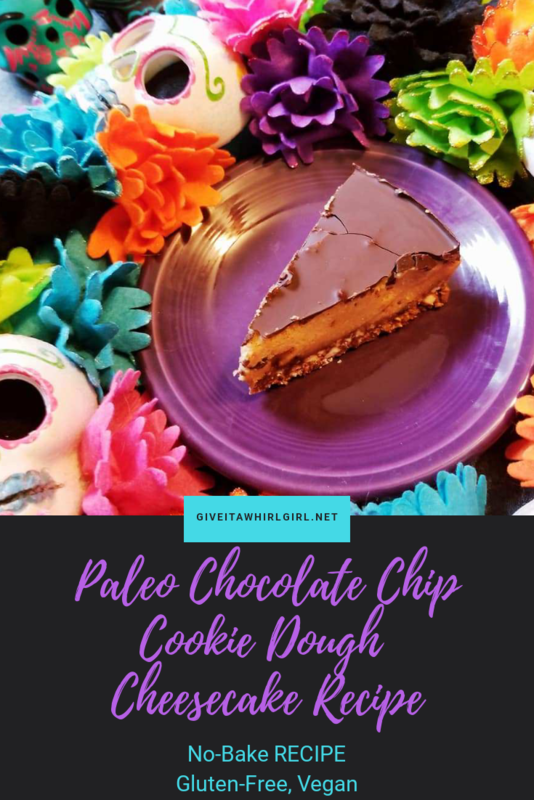 This paleo, vegan, and gluten-free Chocolate Chip Cookie Dough Cheesecake is a decadent treat for your whole family to enjoy. Before making the crust, soften the Medjool dates in hot water. Line springform pan with parchment paper and spray with coconut oil. Place all ingredients for the crust in the food processor. Process ingredients on high until well incorporated. Spread and press the crust ingredients into the springform pan. Freeze the crust while working on the filling. Place all ingredients into the food processor (except chocolate chips). Blend up until smooth. Remove the filling from the food processor and place in a medium bowl. Stir in the 3/4 cup of vegan chocolate chips. Place the mixture in the springform pan on top of the crust. Smooth it out the best you can. Place 1 cup of vegan chocolate chips and the coconut oil in a small saucepan. Stir until melted. Remove from burner and allow to cool a few moments. Take the cheesecake out of the fridge and evenly spread the chocolate ganache on top until completely covered. Place in the fridge for 5 more hours and allow it to set. To maintain freshness, please place your cheesecake in the refrigeratorÂ .This cheesecake will last approximately 5 days. You may use 4th & Heart Vanilla Ghee for an extra touch of flavor. I hope you enjoy this recipe as much as I did and my little family of three did. We each enjoyed a slice after our dinner last night. Usually, when I mention the word “cheesecake” to my family they shudder a bit. They are not cheesecake fans BUT I always encourage them to eat with an open mind. Guess what? They loved this faux cheesecake! The great thing about this cheesecake is that it is actually leaning towards the side of being healthy. It is chockful of almonds and cashews and it does not contain any refined sugars or dairy. So go ahead and indulge a bit! Even go ahead and have a nice slice for breakfast if that is what your heart desires. I will let you in on a little secret~ I do! What is your favorite flavor of cheesecake? Leave me a comment and let me know. I might just make it into a vegan cheesecake someday! These items needed to create this recipe are all available at Amazon. If you have a Prime membership the items ship for free with 2-day shipping. If you are not yet a Prime member you can sign up for a free 30-day trial. This entry was posted in My Cooking Journey, Recipes and tagged 4th & Heart, almonds, amazon, cashews, cheescake, chocolate chips, cookie, cookie dough, enjoy life foods, ghee, gluten free, glutenfree, healthy dessert, no bake, nuts, paleo, paleo dessert, recipe, vegan. Bookmark the permalink.